Santa Barbara and Ojai are home to a variety of incredible backpacking destinations, and yet, often the biggest obstacle is simply having the knowledge and skills to get started. Through this immersive workshop, you will learn the basic skills needed to comfortably explore and enjoy our local trails. Hot springs, waterfalls, epic views, and unspoiled wilderness are just some of the rewards for those who are willing to make the journey. Each class takes place outside, on one of our local trails, and provides a mix of hands on instruction, immersive exercises, and council sharing circles that allows for learning on many levels. Learn how to orient yourself to the local landscape, and begin learning the skills and awareness that will help you remove the word lost from your vocabulary. Become familiar with maps and creating your own mental maps. Learn about the different gear options and how to choose equipment that suits you. Venturing out onto the land is even more enjoyable when we take time to develop a meaningful connection with it. Learn to see the natural world around you as an ally, rather than an obstacle to overcome, and shift your hikes from feeling like endurance contests to journeys of discovery. And learn how to feel at home in the woods. Practical skills include trail navigation, menu planning, personal care and basic first aid skills. Many of our local trails are overgrown, particularly those off the beaten path. 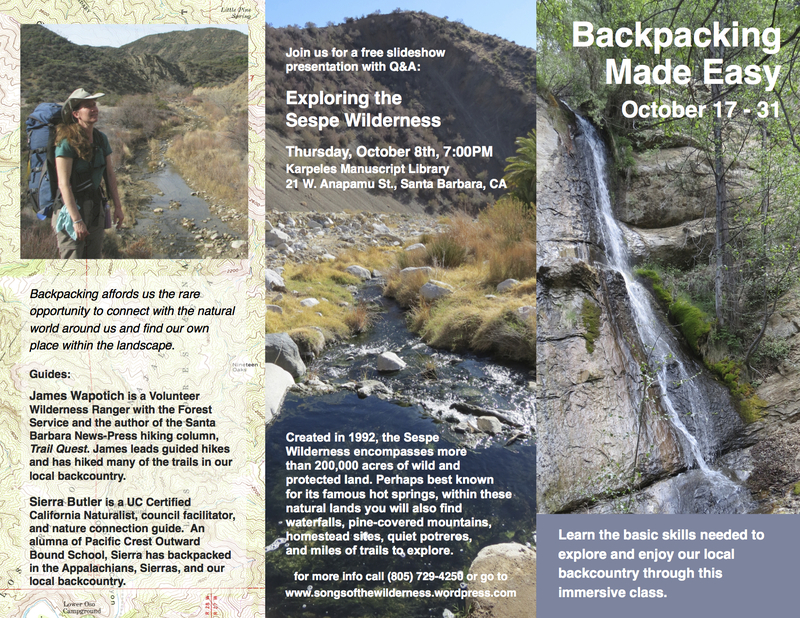 Learn how to read the trails, practice route-finding, and develop your own sense of “body radar” to help you navigate in the wilderness. Practical skills include trip planning, campsite evaluation, water assessment, and camp set up. 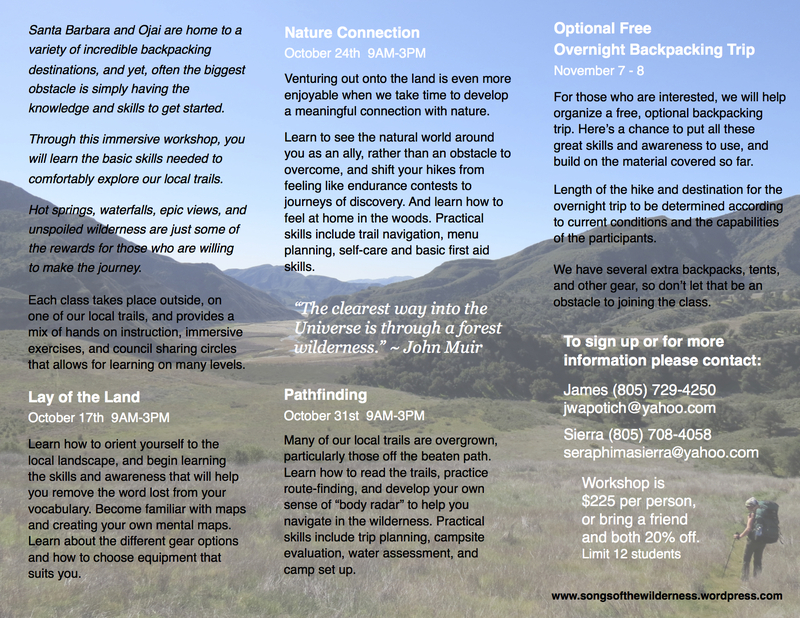 For those who are interested, we will help organize a free, optional backpacking trip. Here’s a chance to put all these great skills to use, and build on the material covered so far. Length of the hike and destination for the overnight trip to be determined according to current conditions and the capabilities of the participants. James Wapotich is a Volunteer Wilderness Ranger with the Forest Service and the author of the Santa Barbara News-Press hiking column, Trail Quest. James leads guided hikes and has hiked many of the trails in our local backcountry. Sierra Butler is a UC Certified California Naturalist, council facilitator, and nature connection guide. An alumna of Pacific Crest Outward Bound School, Sierra has backpacked in the Appalachians, Sierras, and our local backcountry. Workshop is $225 per person, or bring a friend and both 20% off.